2 Bedroom Flat For Sale in Eastcote, Middlesex for Asking Price £430,000. Eastcote's latest development of 1, 2 & 3-Bed apartments has a Ground Floor 2-Bed/1-Bath 721sq.ft apartment boasting a fully fitted Kitchen with integrated appliances, Porcelain tiled Bathroom, flooring and parking. Ideal for First Time Buyers, young professionals, investors or those wanting to downsize, Luna is a contemporary new development offering 1, 2 & 3-Bedroom apartments conveniently located in Eastcote which has a village feel but with all the amenities of a thriving community with its range of shops, eateries and green open spaces catering for all your needs. - Contemporary bespoke fitted Kitchen with soft closing doors/drawers, Stainless steel recessed sink with chrome mixer taps. Integrated Bosch appliances which include Fridge/Freezer, Stainless Steel Single Fan Oven, Ceramic Hob, Washing Machine and Dishwasher (where applicable). 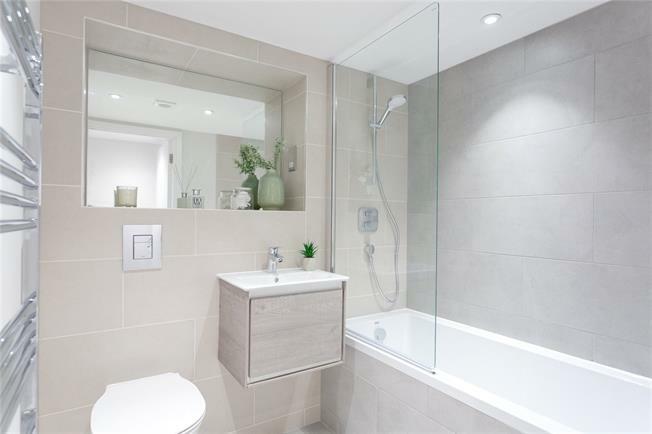 - Bathroom includes Hansgrohe brassware and thermostatic shower, wall-hung closed coupled toilet with soft close seat, Ideal Standard wall hung sink with undermount storage, Porcelain tiling, Chrome heated towel rails, Bespoke fitted mirrors in recess with downlighting. - Flooring to include Engineered wood flooring to Living Room, Kitchen and Hallway. Carpet to Bedroom. - Aluminium double-glazed windows with lockable fasteners. Living Room and Kitchen. Multi socket (power/aerial/satellite/BT) to Living Room. TV point to Bedroom. Mains operated smoke detectors with battery backup. Slimline white sockets and switches. Audio entry phone system. finish with complementary lighting. Secure private letterboxes. Private resident parking bays and cycle storage.